IWCLUL is short for International Workshop on Computational Linguistics for Uralic Languages. 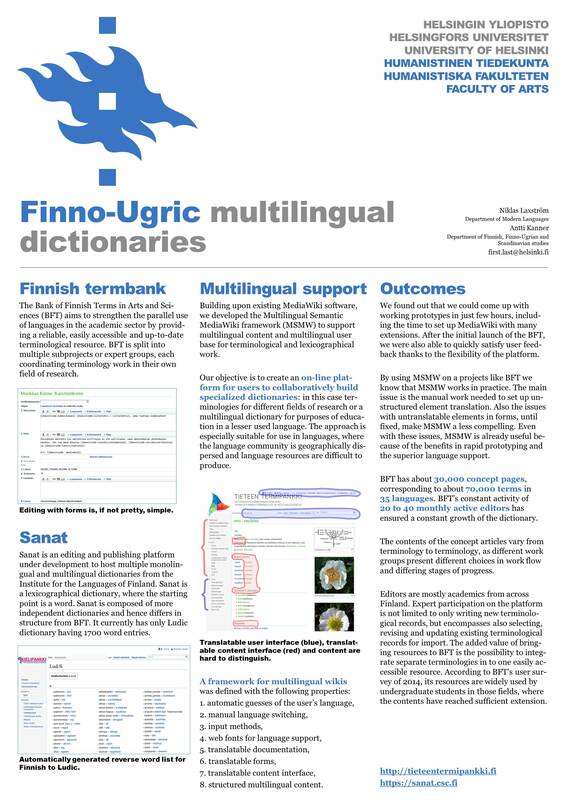 I attended the conference, held on January 16th 2015, and presented a joint paper with Antti on Multilingual Semantic MediaWiki for Finno-Ugric dictionaries at the poster session. I attentively observe the glimmering city lights of Tromsø as the plane lands in darkness to orientate myself to the maps I studied on my computer before the trip. At the airport I receive a kind welcome by Trond, in Finnish, together with a group of other people going to the conference. While he is driving us into our hotels, Trond elaborates the sights of the island we pass by. I and Antti, who is co-author of our paper about Multilingual Semantic MediaWiki, check in to the hotel and joke about the tendency of forgetting posters in different places. Next morning I meet Stig-Arne at breakfast. We decide to go see the local cable car. We wander around the city center until we finally find a place where they sell bus tickets. We had asked a few people but they gave conflicting different directions. We take the bus and then Fjellheisen, the cable car, to the top. The sights are wonderful even in winter. I head back, do some walking in the center. I buy some postcards and use that as an excuse to get inside and warm up. On Friday, on the conference day, almost by miracle, we end up in the conference place without too many issues, despite seeing no signs in the University of Tromsø campus. More information of the conference itself will be provided in the following parts. And the poster? We forgot to take it with us from the social event after the conference. This entry was posted on Monday, February 16th, 2015 at 19:55 and is filed under English, PhD, vapaasuomi. You can follow any responses to this entry through the RSS 2.0 feed. You can leave a response, or trackback from your own site.